Lowdown: The separation of an Iranian couple causes further catastrophe. What do us Westerners know about Iran? Follow the media and you won’t be blamed for regarding it as a war mongering theocracy intent on blowing the world up. Look more carefully and you would see a moderate nation brimming with intellect that is held captive by a theocracy many, if not most of its inhabitants, do not want. To me A Separation, an Iranian movie taking place at Iran, brought with it an opportunity to see what lies beneath and get an understanding, as misrepresenting as any movie could be, for that country. If I could enjoy the film as well then all the better! We start A Separation by being introduced to a husband (Peyman Moadi) and wife (Leila Hatami) arguing over the wife’s right to leave her husband before some judge (hiding behind the camera). We learn the wife wants a separation so she could leave Iran armed with this visa the couple got, but that the husband doesn’t want to leave because he wants to take care of his older father. The verdict? The wife can leave, but the daughter stays with the husband. This separation sets the scene for the drama that follows around the treatment of the grandfather in a household that now no longer has a built in woman’s touch. A caretaker is hired to help, but being religious she has problems doing the basic stuff a caretaker of an old person should be able to do: things like dealing with an unanticipated urination. Genuine trouble follows quickly as direct result of the separation, putting not just our family but also the caretaker’s under the hammer. What follows is strong, serious drama, played and portrayed very convincingly and in a touching manner. 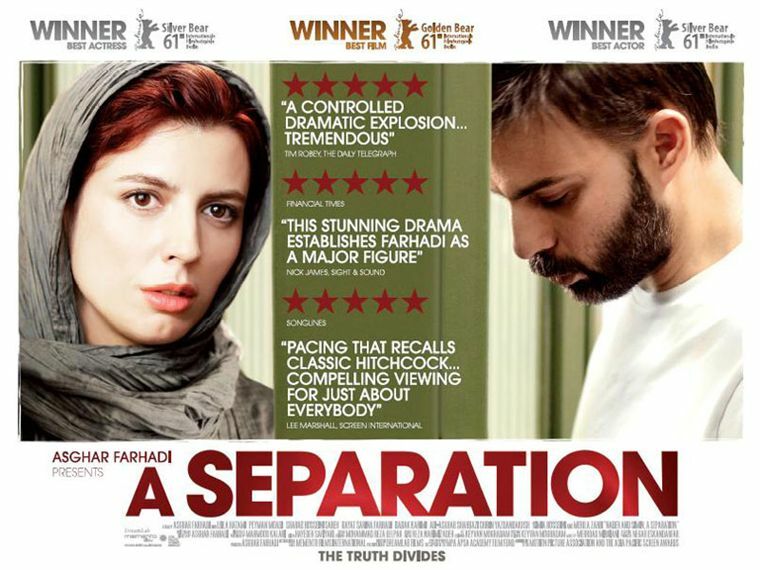 A Separation is basic [family] drama at its best, if a bit over long. However, by far the most interesting aspect of A Separation was the Iran factor. Witnessing how the religious behave themselves and comparing it to the more secular characters, appreciating the way woman are required to behave in the presence of men and the way they cover their heads, and visiting official establishments such as courts and other government offices all tell the tale of a similar yet different world to ours. To me, A Separation is as good an alternative to the tour of Iran I'm forbidden to have as I could get, and an interesting one at that. Once again I learn to value the foreign film! It is interesting to note the way A Separation was shot. Location wise, everything looks ordinary and most locations are quite gray and dreary. The camera hardly bothers taking grabbing the attention, and music is virtually never there – just dialog and sound effects. It’s a bare bones approach, it’s low budget, and it works. Best scene: I liked the court scenes between the husband and the caretaker for their cultural aspects. Totally unlike any court scene setting we are used to! Overall: Very interesting for multiple reasons. 3.5 out of 5 stars.